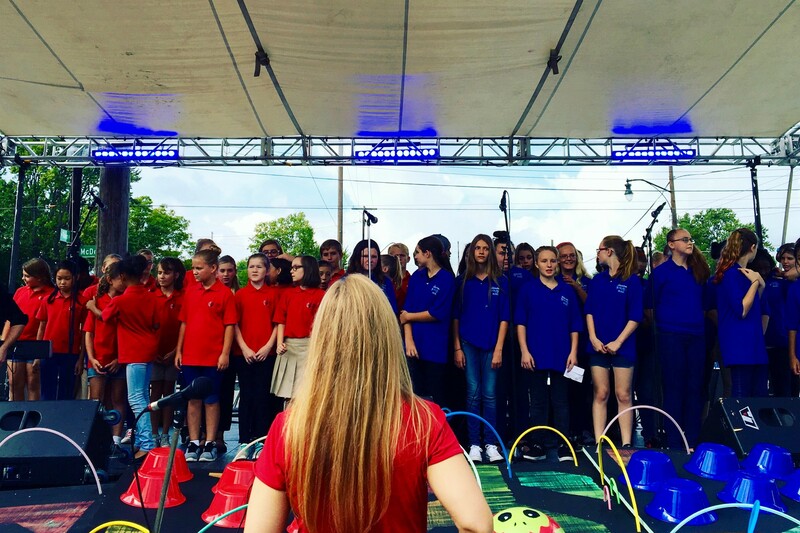 To understand how Columbus’s oldest children’s choir winds up at Columbus’s newest and edgiest festival, you need some background about CCC itself. Columbus Children’s Choir is bigger than you might think. The organization has about 200 kids in what it calls its choral education programs, but that’s not even half of the children they reach. All told, CCC reaches close to 500 kids each year through programs you’ve never heard of, including CCC In Your Schools*. It’s a program that sends a teacher into an urban school to reinforce and expand the choral education the students already receive. This is where we meet the singers at Starling and how we wind up at Independents’ Day. Starling PK-8 is in the heart of Franklinton and consequently in the heart of some tough stuff; homelessness, poverty, and food insecurity. A far cry from the Franklinton of 400 West Rich and other hipster fun. But don’t jump to any conclusions about the quality of education these kids are getting. The administration are lions about getting the very best for their students. It has led to partnerships with Columbus Children’s Theater, BalletMet, and you guessed it… Columbus Children’s Choir. It took more planning than they thought it would and, logistically, they faced a few challenges. “I think mic’ing a children’s choir was new to them,” laughed Starling choral director, Laura Smith, but all parties seemed pleased with the outcome. When asked if they would consider doing it again, there was a cautious optimism mixed with a lot of love for their singers and their city. *CCC In Your Schools is funded by the Ohio Arts Council.